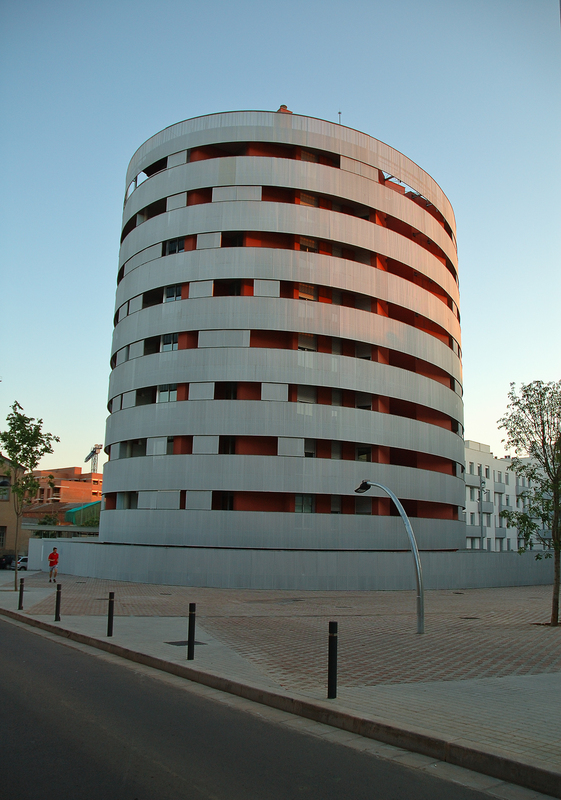 I came across this relatively new building in Sabadell in the outskirts of Barcelona. Not that I am normally attracted by modern architecture, especially when applied to apartment buildings but the fact that it resembles some sort of isolated monolyth, its circular shape and the neat surroundings caught my attention for more than a minute. I don't know how it must feel when you live inside a circular building but it looked innovative enough in the sense that it avoids that monotonous look which city dwellers too frequently have to cope with thanks to inefficient architects that for some enigmatic reason tend to live in state-of-the-art houses. Arquitectura muito interessante. Penso que merece um espaço verde à volta a condizer. Me gusta su forma circular... además se ve imponente junto a la persona que corre. Linda pic.